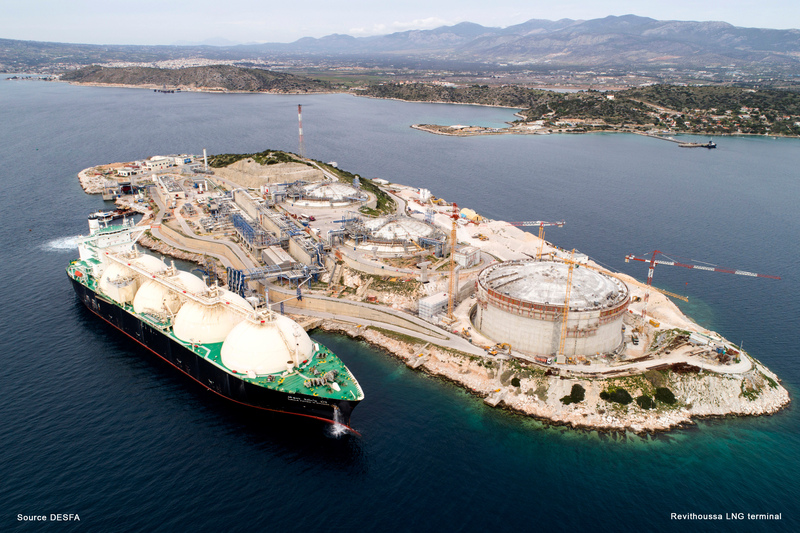 Revithoussa LNG Terminal is an important energy asset of Greece, providing security of supply, operational flexibility of the transmission system and capability to meet peak gas demand. The terminal is located on the island of Revithoussa, in the gulf of Pahi at Megara, 45 km west of Athens. Revithoussa has an excellent safety record since its commissioning in 2000. Designed and operated in accordance with the strictest safety standards both for its employees and for the residents of the surrounding areas, the terminal uses the most environmental friendly technology. The highest safety standards and its respect for the environment are constantly verified and certified by independent operators. The facility is certified for the Quality Management System it applies (ISO 9001), its sound Environmental Management (ISO 14001) and its Occupational Health and Safety Management System (OHSAS 18001). LNG cargoes temporarily stored in the three tanks with a total capacity of 225.000m3. Afterwards, the LNG is gasified by the special cryogenic equipment of the installation (Cryogenic Boil- Off Gas Compressors, Open Rack Vaporizers, Submerged Combustion Vaporizers) and supplies the National Natural Gas Transmission System through the entry point of Agia Triada. Co-funding for the design of small scale LNG jetty is provided by the Connecting Europe Facility of the European Union, within the framework of PMII project. Co-funding for the design of truck loading station is provided by the Connecting Europe Facility of the European Union, within the framework of PMII project, whilst its construction is co-funded by the European Unions’ Partnership Agreement for the Development Framework 2014-2020.